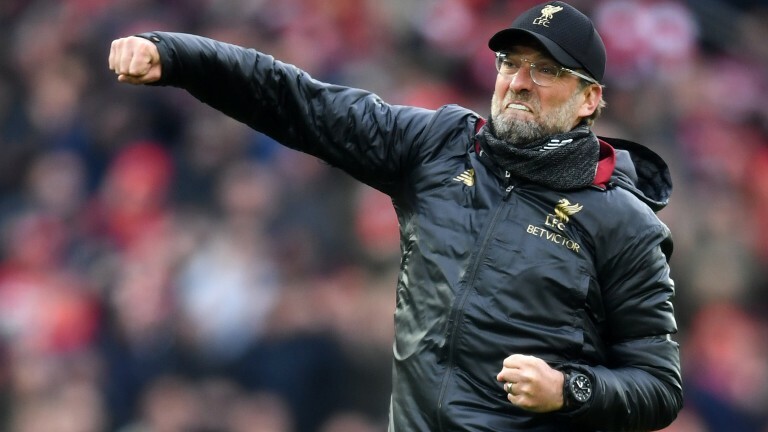 It was billed as a pivotal weekend in the title race, but Liverpool and Manchester City recorded comfortable enough victories to suggest that the Merseysiders won't buckle in their quest for a first championship since 1990. They still need City to drop points somewhere, but Liverpool can only do their own job and they look on course to win their final four league matches, which would give them an astonishing 97 points. If that's not enough then there is not much more Jurgen Klopp's side can do. They are an exceptional side and whoever finishes second this season will rightly count themselves extremely unfortunate. City's 3-1 win over Palace was more comfortable for large periods than the score suggested, with Raheem Sterling's two-goal salvo proving decisive for the champions. Sterling was always going to take the man-of-the-match honours but Kevin De Bruyne pushed him close with arguably his most complete performance of an injury-hit campaign. De Bruyne assisted two of City's goals, the first of which came courtesy of a sublime pass through to Sterling, and he generally controlled the game from his midfield hub. The Selhurst Park show suggests De Bruyne will have a major part to play if City are to land the quadruple. Southampton made it eight Premier League wins in 18 attempts under Ralph Hasenhuttl and their 3-1 triumph over Wolves should ensure that Saints preserve their top-flight status. Hasenhuttl has made a huge impact since arriving at St Mary's - they sacked Mark Hughes with the team stuck on nine points from 15 matches. The Austrian has improved a number of players who had previously been underperforming. James Ward-Prowse has managed to force his way back into the England reckoning and one-cap Nathan Redmond could be next. Redmond's double against Wolves took him to eight for the campaign which in itself it is not particularly remarkable, but his first goal did not arrive until December 22. Such is the gulf in quality that Huddersfield won't be overly shamed by a 4-0 defeat at Tottenham but a much-changed Spurs hit the woodwork twice and only wayward finishing from Fernando Llorente stopped it eclipsing the 5-0 margin by which Town lost at Chelsea. Jan Siewert has dumped Danish trio Jonas Lossl, Mathias Jorgensen and Philip Billing, while Aaron Mooy was only a substitute at Spurs, all pointing towards a subdued finish for the relegated Terriers. They should be fearing their trip to Anfield on April 26 which could be embarrassing if Liverpool sense a chance to seriously improve their goal difference in relation to Manchester City's. Sunderland's crazy 5-4 Sky Bet League One defeat to Coventry has opened the door for Portsmouth to fight it out for automatic promotion with the Black Cats and Barnsley to go up alongside leaders Luton. Pompey, who went eight league games without a win from January 12 to February 23, have suddenly found their best form again, lifting the EFL Trophy and winning six out of seven to move menacingly alongside Sunderland in joint-third spot. Both teams are two points behind Barnsley with a game in hand and Pompey must travel to the Stadium of Light on April 27 in a potential humdinger. Portsmouth's excellent run has coincided with Brett Pitman's return to the first team. The veteran forward has five goals in his last five league outings.